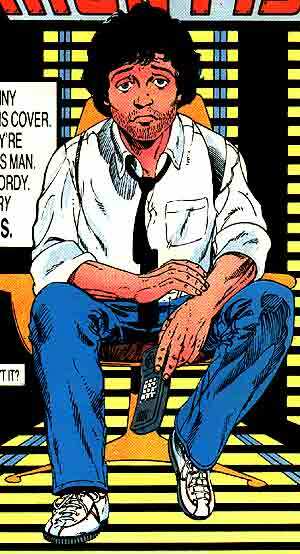 Powers/Abilities: Gordy wielded a cellular phone which could generate a personal force field and transmit particle beams to short out electronic devices. The phone could also be thrown at targets, and returned to Gordy's hand after striking an opponent. While not in use, the cell phone resided in a shoulder holster. 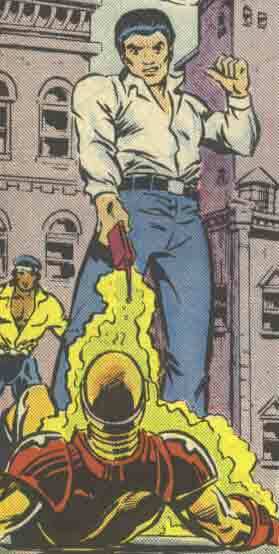 History: (Power Man and Iron Fist#112) - Gordy brought in Power Man to assist S.M.I.L.E. in retrieving Sue McRae (daughter of a Pentagon computer specialist), who had stolen her mother's "bank book" containing valuable data, also being sought by the mercenaries of Control 7. Gordy threatened to shut down Heroes for Hire, Inc. unless Cage found her. Cage was able to find Sue, but she had destroyed the bank book. (Power Man and Iron Fist#114) - Under pressure from Zack and Vinnie of S.M.I.L.E. 's division headquarters to close his case against Control 7, Gordy arranged for Weasel to lead a team of fake Control 7 agents to attack Power Man and Iron Fist, manipulating them into battling Control 7 on S.M.I.L.E. 's behalf, and tricked them into signing a contract with Consolidated Congolmerates, Inc.
(Power Man and Iron Fist#118) - Gordy trailed Power Man, Iron Fist and Colleen Wing to Boston where they brought Iron Fist to see Dr. Druid. Gordy led a team of S.M.I.L.E. agents with him to find out what Power Man and Iron Fist were up to. When Cage and Wing caught the agents spying on them they roughed them up and Wing nearly killed one before Cage halted her, reassuring her that S.M.I.L.E. was "nosey" but not worth killing. When Gordy insisted that Cage and Iron Fist resume their case to track Control 7 Cage responded that their business with Dr. Druid had nothing to do with S.M.I.L.E. and threatened to break Gordy's phone if he kept following them. Gordy secretly observed Cage, Iron Fist and Wing as Dr. Druid teleported them into the dimension of K'un-Lun. (Power Man and Iron Fist#125 (fb)) - Gordy aided Cage against his enemy John Lumus by disguising himself as Power Man and keeping S.M.I.L.E. agents around to monitor the area. Gordy was blasted by Lumus' bazooka, but survived by activating his cell phone's force field. He then used the phone's particle beam to deactivate Lumus' armor. (Power Man and Iron Fist#125) - Following the death of Iron Fist (secretly the H'ylthri imposter), Gordy sat in on the interrogation of Cage alongside Tyrone King (secretly Master Khan), Kris Keating (secretly an imposter working for the Foreigner) and Blake Tower (not secretly anyone). When Cage broke out of custody and went on the run, Gordy alerted S.M.I.L.E. Comments: Created by Christopher Priest, Greg LaRocque and Jerry Acerno. Gordy and Weasel also appeared in a hallucination of Luke Cage's seen in Power Man and Iron Fist#116. (Power Man and Iron Fist#112) - While Gordy prepared Cage for his assignment to retrieve Sue McRae, Weasel came by and asked Cage if he wanted to get in on their office's betting pool for "Bad" Ned Jackson. (Power Man and Iron Fist#114) - Weasel assisted Gordy in his operation to manipulate Power Man and Iron Fist by masquerading as an agent of Control 7 in an attack on Heroes for Hire, Inc., and by scrambling their communications so that they would be fooled into signing a contract with Consolidated Conglomerates Inc.
(Power Man and Iron Fist#118 - BTS) - Gordy spoke to Weasel over the phone while he trailed Power Man and Iron Fist to Boston. 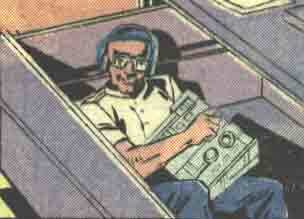 (Power Man and Iron Fist#124) - Weasel hid inside of Gordy's filing cabinet while Luke Cage was in their office and monitored their conversation so that he and Gordy could discuss it afterward. S.M.I.L.E. (Special Military Intelligence Law Enforcement division) is a vaguely-defined intelligence agency with vaguely-defined connections to the CIA and FBI, and no particular public persona. The only known agents include Gordy, Vinnie, Weasel and Zack. S.M.I.L.E. 's principal foes are the mercenary accountants of Control 7, but they have also been entangled in plots with the Yellow Claw and John Lumus.